***Local fuel prices are averaging $10 a gallon, as opposed to the $5.50 a gallon I was paying previously. Fortunately, the only kind I have had to purchase at this price so far is unleaded gas, the fuel that runs the mowers and weed eater used in maintaining the grounds. ***Fuel shortages are limiting the hours the generator powering our cell tower is running. Service is usually on about 4 hours in the morning, then off until around 6 pm, and on again for a few evening hours. Hallelujah, I can still send you a letter! ***Some common household supplies are in short supply around town. Pastor Danny had to postpone the Lord’s Supper service as there was no flour in town to make the bread! While in Port Moresby, I did speak to a fuel supplier that is offering a reasonable price when buying by the barrel – but, I didn’t make a purchase until I figure out how to get it here. If I had to have a barrel flown, the plane I would use could carry two, and I would be adding an additional $500 to the cost of each barrel. Since transporting fuel is considered a “hazmat” flight, no passengers besides the pilots can use the flight to offset the cost. There is talk of a barge scheduled to come to Baimuru as soon as it is repaired, possibly in November. I am in contact with the captain. So, keep praying for the revealing of God’s plan; I know the supply will match the plan! God is faithful. We have what we need to complete this school year, and everyone is excited about the upcoming November graduation. I need to close this letter sharing a big, first time blessing! 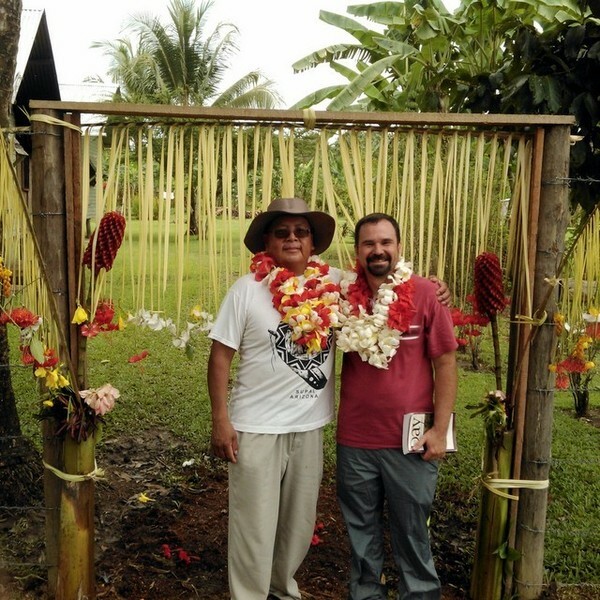 The first week of October we hosted a supporting pastor and church member here in Baimuru! What a terrific encouragement it was to have Pastor Steve Deford and Brother Ray Uquallas from Hualapai Baptist Church of Peach Springs, Arizona. They carried over some wonderful and helpful gifts from church members, friends, and family. It was such fun to go on outreach together in the dinghy, introduce them to new foods, and especially to “see” through their eyes the marvelous work that God has done! Pastor Steve taught in the Institute four mornings, and the principles he taught refreshed us. Our students found Brother Ray’s testimony so interesting as they related with another tribal man! Now that they have been the “guinea pigs” as our first non-family US guests, please consider it safe to plan a trip yourselves! I hope that my saying this does not become trite; it is just worthy of repetition. Your support of this ministry in prayer, giving, and encouragement makes it possible. We are honored and thankful to be your partners in reaching a lost world, and getting the gospel to every creature! Please click for the download of a printable file.